A few summers ago I wrote about how I was learning to green our summer camping weekends. For the most part, it has been steadily improving. 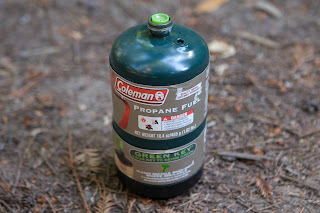 This past weekend we went on another camping adventure and I tried a new can of propane for our camp stove. In the past I've always used the small Coleman canisters that screw onto our stove. Problem is, these cans cannot be refilled nor recycled. I've had to save up the empty ones to dispose at a hazardous waste facility due to the unavoidable remaining propane in the steel container. Coleman has now released a new can in the same size, called the Green Key. It works the same (a one-time use) but it comes with a little green plastic nozzle that sticks in the can once you've used up all the propane. 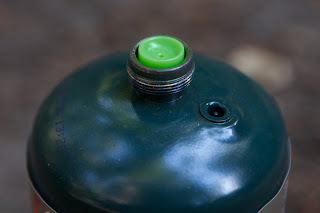 That little green "key" helps release all remaining propane and then signifies the can is safe for recycling. You can also buy the keys separately to use on standard Coleman disposable propane cans. Coleman acknowledges that steel recycling isn't readily available in most communities, but they say the potential is there and the company is working with waste facilities to help keep the cans out of the landfills. I was excited to try it—as you can imagine my eco-guilt grows as my cans pile up! I finished the propane can completely and inserted the green key. Much later, we packed up the car and started our drive home. Almost as soon as we were in the car I could smell propane. The can should have been empty by then (it had been over an hour!) But we didn't take any chances. As soon as we passed a garbage can we tossed it out. Bummer! Maybe I need to look at a way to get a bigger, reusable/refillable tank of propane attached to our stove. Might be a little hassle, but worth the effort. just got back from camping. same discussion. bummer! Thank Amerigas and REI for funding this project. They are now working with Montana State University to develop a similar machine for bear spray.